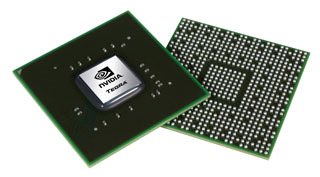 Nvidia already preparing next-generation system-on-chip solution, Tegra 3. Claimed to be the world’s first quad-core mobile solution, Tegra 3 will feature up to four Cortex-A9 cores clocked up to 1.5 GHz. Tegra 3 chip (T30) has an ultra-low power CPU mode, faster by 3 times the graphics performance of its predecessor, will support Blu-ray video and support displays a maximum resolution of 1920 x 1200 pixels. 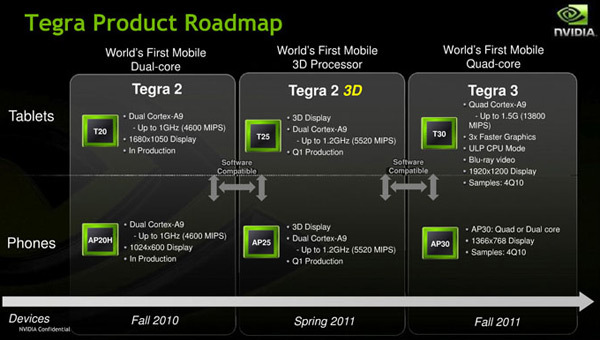 The smartphone/superphone Tegra 3 offering (AP30) will have two or four cores and support resolutions up to 1366 x 768. Both Tegra 3 readying samples since the fourth quarter of 2010 and the first devices based on them will launch this fall.